Precast concrete box culverts are steel reinforced. There are several accepted ways to install the reinforcement and the overburden appropriately sizes the amount of steel reinforcement needed. This box culvert has specific loads associated with this site and conditions of use in a high rainfall alpine area on the River Bealey riverbed beneath the Tranzalpine railway. 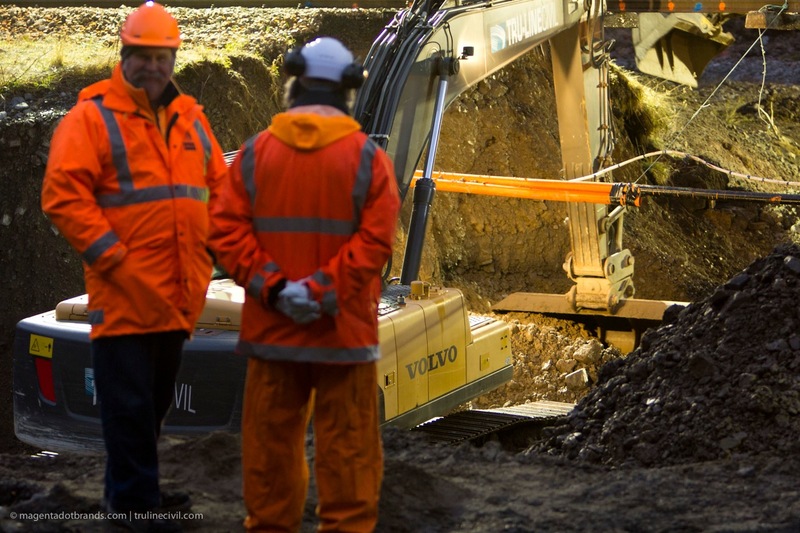 These conditions include burial depth, rail traffic, waterway loading, and impact loadings. The reinforcement in these box culverts is significant and that same reinforcing along with quality concrete and installation by TruLine Civil ensures at least a 100 year life cycle of service for this valuable component of infrastructure. The collegial oversight of the project by the main stakeholders was fine-grained. TruLine’s best practice compliance with rigorous quality assurance standards ensured the job was completed to standard, to budget, and in record time. State Highway 73 (SH73), or Arthurs Pass, is the primary and most direct transport link between Christchurch and the West Coast. It provides a strategic link not only to the towns of Greymouth, Hokitika and Westport but to the entire West Coast and is therefore an arterial route for tourism as well as basic infrastructure. The highway also sits within scenic Arthurs Pass National Park and affords easy access to the Park’s myriad alpine natural, historic and scenic short walks and spectacular roadside viewpoints. TruLine Civil commenced construction on this realignment project in May 2015. The realignment aims to improve road safety and reliability while minimising environmental impacts on Arthurs Pass National Park. A key component of the endeavour to minimise environmental impacts was the redesign and overall upgrade of the many culverts which pass from the Mingha Bluff catchment, beneath the road and carry on under the East-West branch of “Kiwirail’s” Christchurch to Arthurs Pass and Greymouth railway. 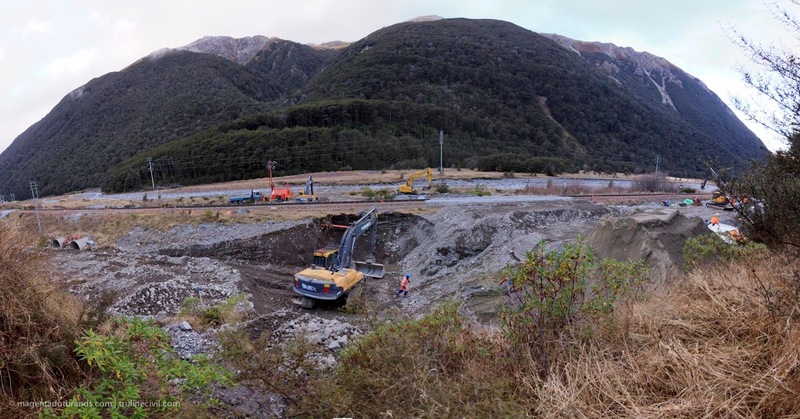 Other sections of SH73 have been substantially upgraded over previous years, including major projects such as the Otira Viaduct, Candy’s Bend and Goat Creek improvements. A steady increase in traffic using the highway has resulted as the route is become safer, less challenging to drive and more reliably open in most weather. Safety is the major concern along SH73, particularly between Mingha Bluff and Rough Creek, as this section has been one of the last risky, difficult, narrow sections. The road is narrow at many points and there are a sequence of tight corners that have very poor sight distances. This section of Arthurs Pass has therefore been unsuitable for cyclists and pedestrians due to the narrow winding road, tight blind corners and the lack of a road shoulder between rocky bluffs and steep drop-offs in several places. One of the streams, from the steep Mingha Bluffs catchment, that the culvert will contain. 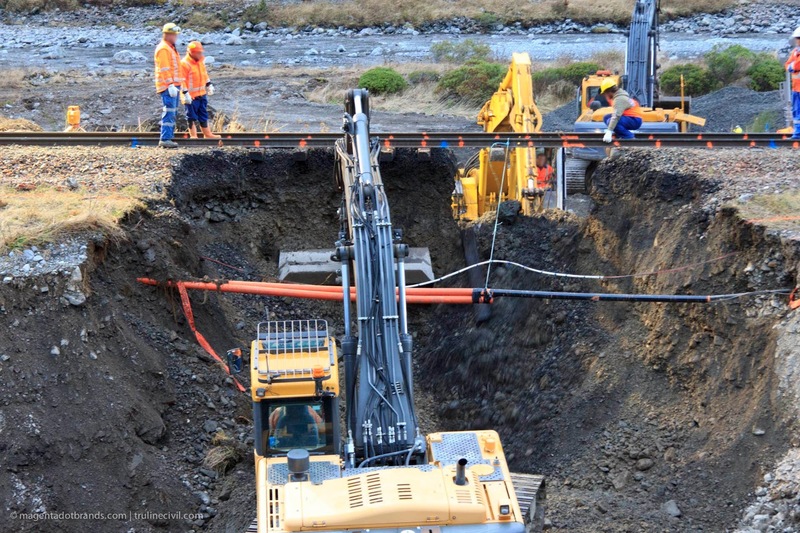 The timing of the crane and support truck, which drove up from Christchurch, was coordinated with the excavation and readying of the culvert bedding gravels.